This Air Cruise Collection is exceptional. Tailored itineraries are exclusively designed by the team who have more than 30 years’ experience in designing and planning expeditions for the sophisticated adventurer. Air Cruise Collection certainly know what it means to deliver valuable and memorable travel. Departing from London and avoiding any airport queues, their private jet offers 54 exclusive window and isle business seats and attentive crew who cater to every detailed need throughout each daytime flight on the expedition. The itinerary includes seven carefully selected countries: Jordan, India, Vietnam, Cambodia, Laos, Maldives and UAE and VIP treatment is organised where possible at each airport. The first destination is Petra in Jordan, one of the seven new wonders of the world, also known as ‘the rose-red city half as old as time’ with 800 monuments including the famous Khazneh which featured in the film ‘Indiana Jones and the Last Crusade’. Guests enjoy two nights at the spectacular Al Manara, a recently opened Luxury Collection Hotel located at the mouth of Jordan’s Saray Lagoon, on the shores of the Red Sea. The journey continues to unfold with a five-hour flight to Agra and its many architectural wonders, with a stay at the luxurious Oberoi Amarvilas Resort, where each room offers a breath-taking view of the Taj Mahal. Next stop Hanoi, one of the most ancient capitals of the world, is abundant in contrasts from the French colonial history and architecture to the bustle of old district markets to the calm of the Temple of Literature. A three-day cruise on board the exclusive balconied 30 cabin Au Co to the UNESCO World Heritage Site of Halong Bay promises vistas of stunning landscape and unrivalled hospitality. Laos with its welcoming people and vast number of temples nestled in green and mountainous landscape rising from terraced paddy fields is the next stop on this exciting itinerary. 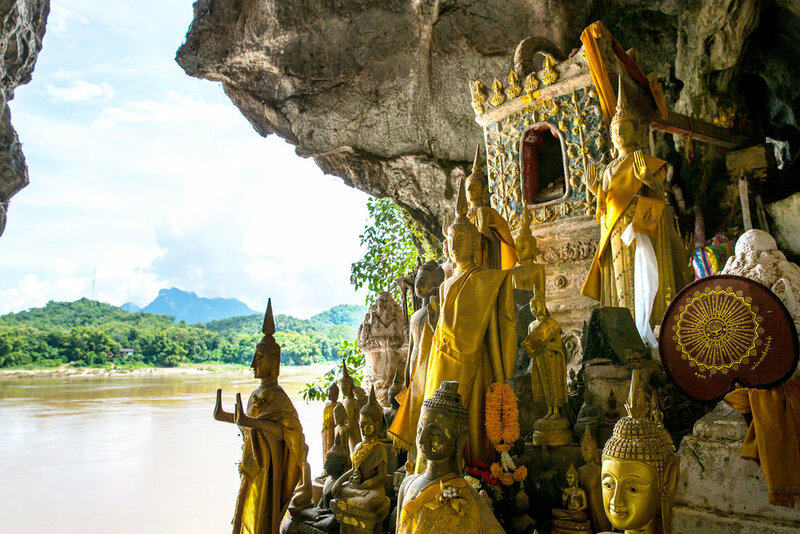 Laos remains relatively untouched, evident when sailing along the Mekong River to the sacred Pak Ou caves or visiting the spectacular Kuang Si waterfalls. A short flight to Siem Reap in Cambodia, guests spend two nights at the Belmond La Residence d’Angkor, visiting the 12th century Angkor Wat, Angkor Thom by TukTuk and the Bayon Temple with its 54 towers. Dinner is another indulgent event served in a surprise location. Next it’s time to unwind for a few days at The Hurawalhi Island Resort in the Maldives which is unrivalled, extraordinary and unique with its environmentally-friendly innovations, breath-taking underwater restaurant, tropical Champagne Pavilion and stylish villas. The final stop is Abu Dhabi and a stay at the magnificent Emirates Palace with another surprise location dinner arranged. A tour of this modern Arabic city, shopping at Ferrari World or visiting the Louvre Museum create a grand conclusion to this extraordinary journey as the final flight returns to London. This experience will certainly tick all the boxes, having seen the most beautiful, hidden and unique places across the globe with unsurpassed service throughout. Departing on the 1st November 2020.